First impressions are always unreliable, but when did that ever stop anyone? 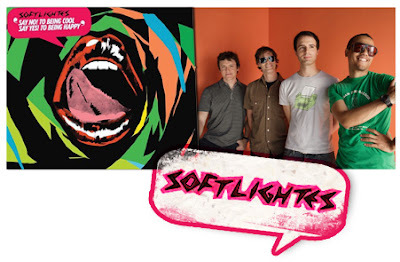 I first thought Softlightes was a band made up of really young freshly-out-of-high-school boys, nerdy (because of their album title) and made music just for the fun of it. But of course, I was wrong yet again. Softlightes is a band that has one of the coolest video and album title around; then again it’s not about being cool is it? Say No To Being Cool - Say Yes To Being Happy is a particular reference to how it’s all about being real and making people happy through songs. So, it’s no shock that their record is - obviously - jam-packed with dazzling pop gems combined with simple light-hearted tunes. ‘Heart Made of Sound’ is light with hints of faint piano keys embellishing the harmonies. It’s almost TV commercial-esque, so it wouldn’t be a surprise to be hearing it playing in the background on one of those mobile phone ads - probably has already. So, next time you watch a certain commercial and a familiar song comes on, we can all shout in unison, “I know this song!”and really mean it. The video is something not to be missed; the stop-motion concept has never looked this good.